It’s been almost four years since LHP Mike Minor made an appearance as a starting pitcher at the major league level. This offseason, the Texas Rangers took a gamble and inked Minor to a 3-year $28 Million contract with the hopes that he could become a staple within the starting rotation. With two starts now under the lefty’s belt, it’s looking like the gamble the Rangers took could pay off handsomely. Minor took on the defending World Series champion Houston Astros and the Toronto Blue Jays both at home in Texas to kick off 2018. As always, with the help of some glorious GIFs, I’ll be visually showing you how Minor’s arsenal and approach is looking thus far. Let’s get right into it! Minor almost exclusively throws a 4-Seam Fastball that averages around 92 mph which also, at times (usually when thrown inside to RHH), brings some beautiful natural cutting action along for the ride. The heater typically starts around 93-95 mph throughout the first two innings and slowly loses its velocity as Minor gets deeper into his outing. Unfortunately, this also tends to take a toll on the cutting movement – as that appears to die down as the pitch count rises as well. Let’s not get too negative out of the get-go though. Let us instead take a look at everything that’s good about the 4-Seamer from Mike Minor. The Fastball from Minor is fantastic in the early going – 93-95 mph with cutting action and plus command to both sides of the plate. As he gets deeper into his outings, however, Minor slowly loses velocity and movement as the Fastball eventually gets all the way down to 89-90 mph and flat horizontally. Coming off a full year of being a reliever with Kansas City, it’s likely that his arm simply isn’t stretched out to the point where he can maintain velocity towards the back end of starts – just something to keep an eye on as the year progresses. Minor throws a Slider that sits from 85-88mph and is very horizontal in movement. It was his go-to offspeed offering in 2017 as a reliever as he threw it nearly 38% of the time. It’s obvious when watching Minor throw the Slider that he’s very comfortable with commanding the pitch to both sides of the plate. The arm-side corner of the dish gets extra attention from Minor with the Slider as he absolutely loves to throw it backdoor to righties. I’ll show you what I mean. I love the Slider from Minor. It was apparent that it was his main secondary offering last year as a reliever as he looks completely comfortable and confident in throwing it. No matter the count, Minor has the ability to throw the slide-piece and command it effectively to both sides of the plate (especially arm-side to RHHs). When the cutting Fastball and Slider are working at the same time, Mike Minor is a deadly weapon. Like the Fastball, however, the Slider also began to lose velocity towards the later parts of starts. The Curveball is the least thrown offering in Minor’s repertoire. It has some good vertical movement (plenty different from the horizontal Slider) but Minor has trouble locating it well enough to be an effective whiff pitch. There were only a couple times when the Curve was thrown within the strikezone or enticing enough to a hitter to be chased out of the zone. While the Curveball usage of roughly 11% is somewhat low, it’s still encouraging that it’s up from the 7.8% usage of last year when Minor was a reliever. Increasing the pitch mix is something he’ll need to do as a starter and it seems as though he’s aware he needs to work in the Curveball more often to keep hitters on their toes. A slightly higher zone rate and fewer spiked Curves 5 feet in front of the plate would bode well for convincing future victims to whiff at the pitch when the count is right. The Changeup has seen an uptick in usage of nearly 10% from 2017 and is fooling hitters to the tune of a 25% whiff rate early on. When you think about it, it makes total sense. All of Minor’s offerings (aside from maybe a flat Fastball) move towards the glove-side of the plate – or inside to righties. The Changeup, and it’s arm-side movement, is the perfect wrinkle to throw into a sequence to catch RHHs trying to get a jump on those offerings that are moving in on their hands. The Changeup is the equalizer in Minor’s 4-pitch arsenal. It’s the only offering that moves to the arm-side of the plate and plays off the darting Slider and cutting Fastball brilliantly when sequenced correctly. The uptick in usage from last year is great to see, as establishing a solid Changeup is an important stepping stone for any starting pitcher looking to survive in the majors. Just one sequencing GIF to highlight this week (I know, I know, I’m sad about it too). Most of the sequences Minor worked were interrupted by either a slew of foul balls or too much nibbling on the edges to be deserving of a look-see. Let’s not focus on what could have been and instead focus on just how nasty this sequence is against Marwin Gonzalez. I came away from watching Mike Minor‘s first two starts of 2018 with a lot of positives. The 4-pitch repertoire is diverse and has potential to sustain effectiveness throughout a third time through most lineups. Minor also mixes all of his offerings very early in games. He was not shy to feature all four pitch types right away as he threw each at least once within the first 10 pitches of his second start against Toronto. I love the potential the Fastball has in the early goings of outings. 93-95mph with cutting action that digs inside on RHHs is tantalizing. If Minor could build arm strength and find a way to keep this going throughout the back end of starts it would benefit him tremendously. His confidence to command the Slider is great as well. Being able to spot the Slider so often on the glove-side corner to righties is a tool that Minor uses to his advantage quite often. The Changeup rounds out the arsenal as the only pitch that moves arm-side and fools those that are expecting otherwise. The Curve could use some work but a 10% usage is still enough to be on the mind of hitters. The fact that Minor is evening out his pitch usage to involve all four pitches as a starter is something I’m a big fan of. Assuming one pitch isn’t completely useless of detrimental, it’s great to have options when approaching the roster three or more times through the order. Minor has dropped his Slider usage (from 38% in 2017 to 24%) in favor of bumping both his Changeup (from 10.9% to 19.4%) and Curveball (from 7.8% to 10.8%) to attain a well-rounded arsenal. It’s not all sunshine on the horizon after watching Minor’s first two starts. I came away with some early causes for concern that would be beneficial to be aware of moving forward. The biggest one being the velocity dropping throughout his starts. Minor’s two most commonly thrown pitches, the Fastball and the Slider, both saw their velocity drop significantly as the pitch count climbed. To go along with the velocity loss, the movement on both his cutting Fastball and sweeping Slider both see a decline as well. The heater seemed to flatten out and the Slider was losing some of its bite in the later innings. Another issue is simply working ahead. In case you weren’t doing the math at home throughout the arsenal breakdown, in his two starts combined, Minor is a grand total 16/41 (just 39%) in first pitch strikes. This leads to higher pitch counts and constantly pitching from behind rather than attacking early and being ahead. He nibbles. He nibbles a lot. Even when Minor gets to two strikes, he plays along the edges a little too much for my liking. It’s just a matter of approach. I don’t doubt that he has the ability to attack more if he wanted to – the command seems to be there for the most part so I trust that this is an issue that will improve (hopefully). 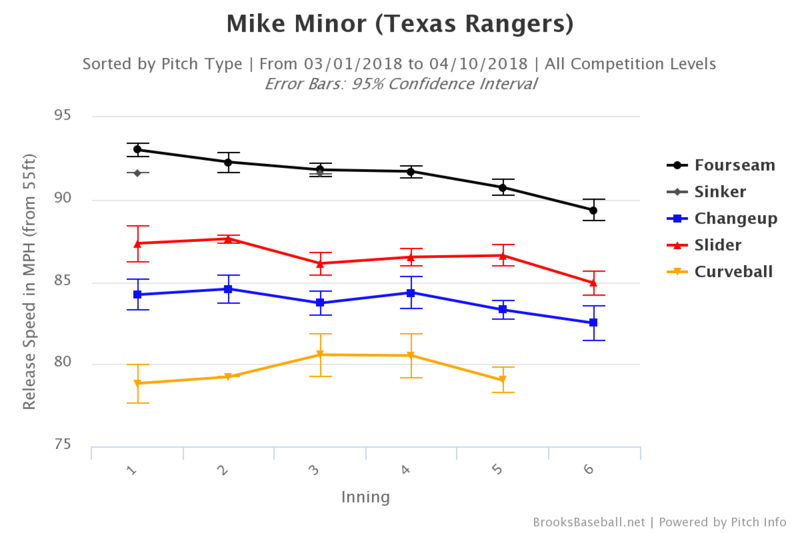 Overall I like the outlook for Mike Minor in Texas. He has four legitimate pitches with potential for each one to provide value in the arsenal. While he hasn’t had to face too many lefties so far (just 2 of 41 batters faced were LHH), I’m confident he has the tools necessary to devastate them just as badly as the righties he’s seen. The velocity and movement of the Fastball/Slider combo are great early on, they just need to keep that status deeper into starts in order for Minor to remain effective. I love the Changeup and really like the jump Minor has taken with it’s usage as a starter. While the Curve hasn’t been great so far, it has the differentiation in movement and speed from the Slider to be effective if commanded better. If Minor can find a way to keep his velocity up and work ahead in counts more often, while also being more aggressive when ahead (less nibbling), I don’t see any reason why he can’t continue to see results similar to what we’ve seen so far. As a Mariners fan, I’m not excited about him being in the AL West. As a fantasy analyst, I’m thoroughly excited to see what Mike Minor can do as a member of the Rangers rotation for the rest of 2018. Baseball fanatic. Mariner faithful. Former college pitcher who now uses his passion for pitching to break down the arsenal and approach of MLB's newest arms. @IanPostPL on Twitter. Love these articles. Keep them coming. Thanks for reading, Big Tuna! Will do.